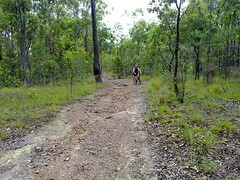 Last week Simon and I rode from Wamuran to Moorina along the historic Old North Road. This week we wanted to complete the southern section of where we think the road went, between Kurwongbah and Moorina. We started at Dunlop Lane then headed north along Smiths Road where it crosses Mosquito Creek. 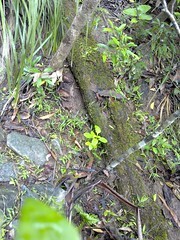 I looked around here for any traces of an old bridge but could find nothing except an old beam in one of the banks. Merelyn very kindly let us look around her property which is on the southern end of historic Franz Road where it used to meet Alf Dobson Road. She showed us the remnants of the Old Road, with what I think are survey marks clearly chopped out of a dead tree near the road. 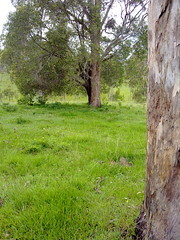 Merelyn has records of the road reserve being re-gazetted from it’s historic route past her front door, to a point along one of the boundaries of her farm. The ground is heavily compacted showing evidence of frequent traffic at some time in the past. Merelyn has had conversations with several old-timers who tell her cattle used to be driven southwards along the road prior to the early 20th century. Cliff, Owen and Cathy very kindly let us ride through their farm trying to find any remnants of the road. As Franz Road heads north, we tried to retrace the road by referencing an old survey plan by William Fryar in 1868. These old trees are close to where Fryar’s plan showed trees that he used as reference markers for his pegs. Unfortunately the original trees are long gone. 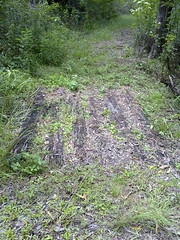 I would have made a hopeless surveyor, and found it difficult to differentiate between what I thought were remnants of the old road, and more recent farm tracks. 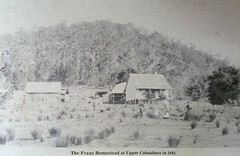 Cathy showed us this old photo of the old Franz homestead near where we passed. Judy and Ken kindly showed us the remnants of an old road passing through their property. Judy tells me that the road was used by Cobb & Co in the 19th century. It winds up a fairly steep hill, and in some places it’s possible to see evidence of past maintenance, including an old log bridge, and frequent large rocks lining the sides of the road. More interesting pics! It’s a wonder I didn’t see you on Sunday as I must have been down working by the grid when you went past! We took so long coming along Franz Road that we didn’t manage coming up your way until about 1pm. I got home about 2-3 hours later than expected. 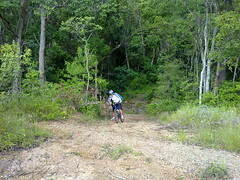 Martin, Can you give me directions to get to the “old dirt short cut” near mt Mee. It sounds like a nice place to get to for the view and morning tea . 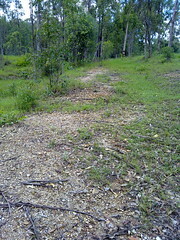 Can you drive up this track in a 4wd. Thank you. You could do it in a 4wd. 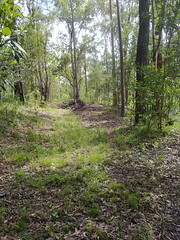 The “old dirt short cut” starts at the corner of Moorina Road, and Mountain View Road, Moorina. Head up Mountain View Road. 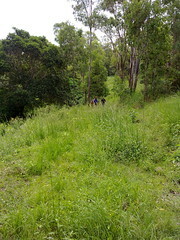 It eventually turns into Rieck Road, and becomes very steep and rocky. You should exercise care here. After a couple of km it flattens out into a dirt track and you end up at Ocean View Road. 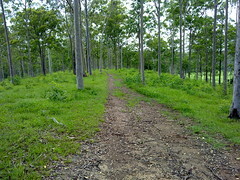 Turn right to head up to Mt Mee. 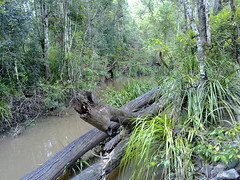 I live in Pine Rivers like yourself. 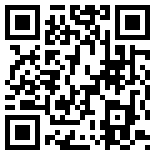 I have enjoy reading up on your adventures since discovering your site a couple of months ago. 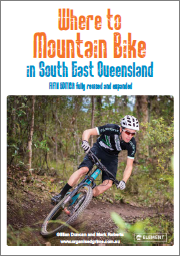 I enjoy exploring our area with a couple of mates by bike and was looking for some new challenges. So this has raised a couple of questions regarding riding through Dunlop Lane and Smith road and doing the big loop, is there any problems with infringing on peoples private property. Do we need permission from anyone. 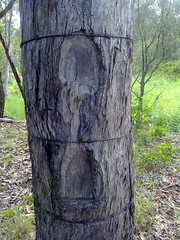 Are the trails fairly well marked. 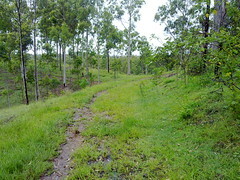 Dunlop Lane runs through private property. You’d need permission. I’ve emailed you some info.